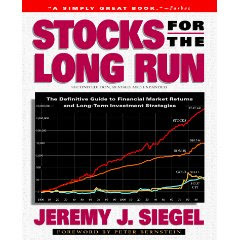 Jeremy Siegel defends the Efficient Markets Hypothesis: When you are at Wharton as I was during my undergraduate years, it is hard to escape the aura of the school’s most famous finance professor Jeremy Siegel. Even before I was interested in the stock market I had read his now somewhat controversial book Stocks for the Long Run. As a result of the recent crisis and miserable track record of the S&P over the last 10 years, Siegel has had to deal with a significant amount of criticism. Many financial commentators now suggest that buy and hold is dead. Those who disagree point out that Warren Buffett has used a buy and hold strategy that has made him one of the world’s richest men. The problem with using Buffett as an example is that Berkshire is now so large that the portfolio is very inflexible and thus is forced to employ a buy and hold platform. Entering into or exiting a material position is a major undertaking that has the potential to dramatically affect the price of a stock, especially considering the way value investors react when they hear Buffett is buying or selling. I personally believe in buying and holding a basket of equities. However, that basket needs to change over time based on where the value is. Whether the allocation changes by sector or by country over time, my own philosophy is that being nimble is preferable. The idea that serious investors should buy and hold an index or a basket of the same stocks is an outcropping of the EMH that detracts from returns and sets investors up to be slaughtered when there are broad market declines. The misreading of these economic trends did not just reside within the private sector. Former Fed Chairman Alan Greenspan stated before congressional committees last December that he was "shocked" that the top executives of the financial firms exposed their stockholders to such risk. But had he looked at their balance sheets, he would have realized that not only did they put their own shareholders at risk, but their leveraged positions threatened the viability of the entire financial system. As home prices continued to climb and subprime mortgages proliferated, Mr. Greenspan and current Fed Chairman Ben Bernanke were perhaps the only ones influential enough to sound an alarm and soften the oncoming crisis. But they did not. For all the deserved kudos that the central bank received for their management of the crisis after the Lehman bankruptcy, the failure to see these problems building will stand as a permanent blot on the Fed's record. (1) I know all of the government stimulus is only “temporary” (kind of like how Japan’s 20 years of bridges to nowhere has been temporary) but an economy so dependent on government spending is unequivocally not more stable. Building an economy based on fiscal irresponsibility creates a house of cards situation in which the removal of one card can bring the entire system crashing down. (2) The financial system is even more concentrated and the previously too big to fail firms are now even bigger. I don’t think I even have to mention the absolutely insane amount of notional derivatives held by the largest banks in the US. Somehow I don’t equate those positions with stability. As Nassim Taleb has pointed out recently, the current system is far from being robust and is actually more fragile than before. (3) I have read a number of conflicting arguments regarding whether or not our trade imbalances with China and the Asian Tigers had a hand in creating the Great Recession we are still living through. I am not an expert on international monetary flows or trade, but intuitively this dynamic in which the US imports far too much and then our creditors use the dollars they receive to buy our debt does not seem to add to stability in any way. But this does not mean that risks have disappeared. To use an analogy, the fact that automobiles today are safer than they were years ago does not mean that you can drive at 120 mph. A small bump on the road, perhaps insignificant at lower speeds, will easily flip the best-engineered car. Our financial firms drove too fast, our central bank failed to stop them, and the housing deflation crashed the banks and the economy. In 2003, 123 nations committed themselves to “a significant reduction of the current rate of biodiversity loss” by 2010. According to scientists at a recent United Nations-sponsored biodiversity conference, that target will not be met. Biodiversity loss keeps accelerating, and extinctions are occurring at a rate that’s 100 times what it was before humans dominated the earth. Species are going out like candles in the dark. The “cautiously optimistic” authors of the United Nations food report believe that humanity will somehow be able to produce more food while still honoring the value of other species by protecting their habitat. And it’s true that this is not a zero-sum game. A 70 percent increase in food production doesn’t necessarily mean a 70 percent reduction in habitat. But the Food and Agriculture Organization also warns that agricultural acreage will have to grow by some 297 million acres, a little less than three times the size of California. Add to this the ongoing rate of habitat destruction — including deforestation, often for fuel but usually for producing more food — and other threats like the growing production of biofuels, and it is hard to argue that there isn’t a profound conflict between what our species will need to survive by 2050 and the needs of nearly every other species on this planet. The question isn’t whether we can feed 9.1 billion people in 2050 — they must be fed — or whether we can find the energy they will surely need. The question is whether we can find a way to make food and energy production sustainable in the broadest possible sense — and whether we can act on the principle that our interest includes that of every other species on the planet. Unfortunately, these reforms may ultimately be undermined by one very significant weakness – the explicit requirement in the bill that the identification of systemically dangerous financial firms by federal regulators remain entirely secret, and never be revealed to the public. This is the bill’s Achilles heel. The decision that there be “no public list of identified companies,” as the bill currently reads, stems from a belief that secrecy about the identity of these firms will limit moral hazard. However, after more than a year of costly bailouts, the federal government’s implicit guarantee of major financial firms is, sadly, rock solid. To try to make it magically disappear by refusing to name the most systemically dangerous firms not only won’t work, but will severely jeopardize the effectiveness of the regulation itself. ● First, the bill does not require the systemic regulator to adopt a consistent (or universal) set of tough standards for all systemically dangerous firms, presumably to avoid compromising the secrecy surrounding these “identified” financial institutions. ● Third, the attempt to ensure secrecy requires that all of the regulators’ reports to Congress themselves remain strictly confidential, thus weakening – and perhaps crippling – the essential process of democratic oversight. Perhaps most disconcerting, all of these compromises will most likely be for naught, since the desired secrecy seems almost impossible to achieve. Virtually everyone already knows the identities of the most systemically dangerous firms; and, beyond that, leaks are inevitable. So, on one hand the Gov’t through massive spending as managed to cause a rush to buy low-end houses by first-timers and investors. This was done at the right time and is a success, no doubt. But on the other hand they put out HAMP, which prevents foreclosures and is keeping the very low-end supply that is in such high demand off of the market. In fact, the low foreclosure counts are undermining the housing market at this point in time, which is why house sales are falling at the same time you are hearing stories of 30 bidders for each foreclosure resale and sellers not dealing with buyers who require financing in favor of cash buyers, even at a lower price. Keeping troubled borrowers in houses and good buyers away is a perfect example of an unintended consequence of government action that will push out a true recovery indefinitely. As a matter of fact, because of the neutralizing effect that housing market government stimuli vs. HAMP has, if hundreds of billions were not thrown at the market, we would likely be sitting right where we are now anyway…tax payers would just be that much richer. HAMP and the other mod initiatives and foreclosure moratoriums have effectively served as the longest foreclosure moratorium seen yet. Millions of underwater, over-levered zombie renter-homeowners squatting in their house because of a loan mod simply ensure the housing market remains a heavy and volatile asset class for years. Who thinks the US dollar carry trade is going to end badly? (Raising hand): Hat tip to Steve Keen’s Debtwatch for posting the link to this article in The Age. If you are unfamiliar with Steve Keen, he is Australia’s version of Nouriel Roubini in the sense that he could also be called Dr. Doom. Not only is he incredibly bearish on the Australian banking industry (which looked like a good short in the July and now looks like an incredible short), but also thinks that the country is likely to see a property value bust not so dissimilar to the one the US has experienced. Given all of this, it is no surprise that the recommended reading on his site have a bearish tone. The following article suggests that a huge amount of foreign portfolio investment into Australia (financed by cheap borrowing rates in the US and UK) has poured into bank shares and has caused them to run up much more than the ASX has. What happens if that carry trade reverses and people who are effectively short US dollars have to buy them back? Well, the implication is that it would cause people to flee from Australian securities and would crush the AU dollar. It’s as though we haven’t learned a thing from this crisis and the housing bubble in the US. Free money distorts so many things it is impossible to anticipate the global magnitude of the unintended consequences of money printing in the US. US and British commercial banks can borrow from their central banks at a rate less than 1 per cent. The equivalent RBA rate is 3.25 per cent and many pundits are forecasting the rate could go to 3.75 per cent before the end of 2009. This will increase the differential between Australian and British and US interest rates and make the scope for speculative profits even higher. Since the beginning of the year, $64 billion has poured into Australia in the form of direct and portfolio (share) investment and foreign lenders have switched $80 billion of foreign debt payable in foreign currencies to Australian currency. Most of the portfolio investment ($41 billion) has gone into bank shares. Banks now represent 40 per cent of the value of shares traded on the stock exchange, and while shares in the big four bank shares have increased by about 80 per cent (as measured by CBA shares), the Australian Stock Exchange Index has risen by only 30 per cent. Foreigners have shifted out of Australian fixed interest debt and into equities because as interest rates go up, the capital value of fixed debt declines. By driving up interest rates to curb inflationary expectations and the prospect of a housing price bubble the RBA is in far greater danger of creating a stock exchange asset price bubble as well as an Australian dollar bubble. Once foreigners believe interest rates have peaked, the bubbles are likely to be pricked as financial speculators attempt to realise their gains. This could lead to a stampede out of Australian denominated securities. Economics, as a field, got in trouble because economists were seduced by the vision of a perfect, frictionless market system. If the profession is to redeem itself, it will have to reconcile itself to a less alluring vision — that of a market economy that has many virtues but that is also shot through with flaws and frictions. For a value investor like me, the above is nothing more than a statement of the obvious. Humans are irrational creatures. They oscillate between fear and greed with remarkable speed and agility. They buy when they should be selling and run for the exits as a herd when they should be searching for value. Thus, any market that involves humans is going to embody the traits of its constituents. While market rationality and efficiency may influence the asset values over the long run, in the short run anomalies and dislocations can persist long enough for investors who dig for inconsistencies to profit. [M]acroeconomics has divided into two great factions: “saltwater” economists (mainly in coastal U.S. universities), who have a more or less Keynesian vision of what recessions are all about; and “freshwater” economists (mainly at inland schools), who consider that vision nonsense. So here’s what I think economists have to do. First, they have to face up to the inconvenient reality that financial markets fall far short of perfection, that they are subject to extraordinary delusions and the madness of crowds. Second, they have to admit — and this will be very hard for the people who giggled and whispered over Keynes — that Keynesian economics remains the best framework we have for making sense of recessions and depressions. Third, they’ll have to do their best to incorporate the realities of finance into macroeconomics. As stated above, I agree with numbers one and three emphatically. It is number two that I am not so sure about. It is true that Krugman’s interpretation of a Keynesian solution is going to be the most effective? It seems to me that there is an additional framework that at very minimum could supplement Keynes’ lessons. This is a good time to remind everyone that I am not an economist and as such I am not particularly well versed in the nuances of what camp or subcategory people belong in. However, I certainly don’t view economics as black or white, winner take all field. Economics is not physics. My guess is that no one is going to come along and knock Sir Isaac Newton of off his ledge. But, the understanding of markets and human behavior is an evolving process and even people with completely disparate views can have profound insights that add to the current theories. So, from my perspective as an outsider, I couldn’t possibly care less what a person calls himself or herself as long as the ideas and methodology are sound, compelling, and based on actual human nature (rather than relying solely on complex and somewhat dissonant models). He believed in capitalism, but also believed it had almost a genetic weakness. Modern finance, he argued, was far from the stabilizing force that mainstream economics portrayed: rather, it was a system that created the illusion of stability while simultaneously creating the conditions for an inevitable and dramatic collapse. As people forget that failure is a possibility, a “euphoric economy” eventually develops, fueled by the rise of far riskier borrowers - what he called speculative borrowers, those whose income would cover interest payments but not the principal; and those he called “Ponzi borrowers,” those whose income could cover neither, and could only pay their bills by borrowing still further. As these latter categories grew, the overall economy would shift from a conservative but profitable environment to a much more freewheeling system dominated by players whose survival depended not on sound business plans, but on borrowed money and freely available credit. Once that kind of economy had developed, any panic could wreck the market. The failure of a single firm, for example, or the revelation of a staggering fraud could trigger fear and a sudden, economy-wide attempt to shed debt. This watershed moment - what was later dubbed the “Minsky moment” - would create an environment deeply inhospitable to all borrowers. The speculators and Ponzi borrowers would collapse first, as they lost access to the credit they needed to survive. Even the more stable players might find themselves unable to pay their debt without selling off assets; their forced sales would send asset prices spiraling downward, and inevitably, the entire rickety financial edifice would start to collapse. Businesses would falter, and the crisis would spill over to the “real” economy that depended on the now-collapsing financial system. Every time I read those passages something about them resonate with me even more. Not only do they aptly (and maybe even perfectly) describe the mechanism behind the fantastic debt bubble that so unceremoniously popped, but they also offer a valid assessment of the human component of financial instability. Simply, people got euphoric and then became complacent with success. Obviously there are those of us who are never satisfied and always strive to do more. But the majority of people are what Nassim Taleb would describe as Thanksgiving turkeys. Every day that something bad does not happen, even in the face of overwhelming evidence of emerging risk, confirms that there is no imminent danger. Or, just like the turkey that trusts the farmer who keeps him warm and well fed a little more each sequential day until that fateful moment, people believe that the absence of a calamitous event means that such a happening is less likely. Not Minsky though. He saw a black swan coming. Minsky spent the last years of his life, in the early 1990s, warning of the dangers of securitization and other forms of financial innovation, but few economists listened. Nor did they pay attention to consumers’ and companies’ growing dependence on debt, and the growing use of leverage within the financial system. By the end of the 20th century, the financial system that Minsky had warned about had materialized, complete with speculative borrowers, Ponzi borrowers, and precious few of the conservative borrowers who were the bedrock of a truly stable economy. Over decades, we really had forgotten the meaning of risk. When storied financial firms started to fall, sending shockwaves through the “real” economy, his predictions started to look a lot like a road map. To prevent the Minsky moment from becoming a national calamity, part of his solution (which was shared with other economists) was to have the Federal Reserve - what he liked to call the “Big Bank” - step into the breach and act as a lender of last resort to firms under siege. By throwing lines of liquidity to foundering firms, the Federal Reserve could break the cycle and stabilize the financial system. It failed to do so during the Great Depression, when it stood by and let a banking crisis spiral out of control. This time, under the leadership of Ben Bernanke - like Minsky, a scholar of the Depression - it took a very different approach, becoming a lender of last resort to everything from hedge funds to investment banks to money market funds. Minsky’s other solution, however, was considerably more radical and less palatable politically. The preferred mainstream tactic for pulling the economy out of a crisis was - and is - based on the Keynesian notion of “priming the pump” by sending money that will employ lots of high-skilled, unionized labor - by building a new high-speed train line, for example. You can clearly see the influence of Keynes in those proposed solutions. Curiously enough, these policies are almost identical to those that the executive branch and the Fed have put into action. In many ways, this is also similar to what Krugman continues to advocate, at least when it comes to fiscal stimulus. Will it work? Your guess is as good as mine. Although, I have a sinking suspicion that piling on more debt to try to get us out of an over-leveraged conundrum may not be the best strategy in the long run. Having said that, it gives me a modicum of hope that a man like Minsky, who understood the fragility of markets and the vicissitudes of human nature, believed that a Keynesian reaction to a financial crisis was the best path to follow. Let us all pray that his prescience when it came to instability extends to the dynamic of returning to prosperity. At what point does the Keynesian response to the crisis become dangerous? By now it is clear to every man, woman, child and domestic animal in America that the policy prescription to get us out of this financial and economic quagmire is to throw stimulus dollars into the mix and print money. While this has plenty of gold bugs and fiscal conservatives understandably up in arms, the truth is that nobody knows for sure that the current actions of the government and Fed are going to produce severe inflation. There is no shortage of people calling for hyperinflation down the road at the same time that there are numerous pundits warning of imminent deflation. It is amazing how polarizing the inflation-deflation debate is. The only question that I think brings out more diverse opinions is whether the current rally in the stock market is the beginning of a lasting bull market or just a back-breaking bear market rally. By now, one would hope the inflationists would challenge their own views, doctrines and Mentalities. Instead, they trumpet the same old failed policy responses – only in much larger dimensions and with greater conviction. And that is precisely the flaw in inflationist doctrine: once it gets rolling it becomes extremely painful to rein in the forces pushing for only greater inflation. The more spectacular the inflationary boom and bust - the more strident the inflationists become. History is strewn with enough collapses, worthless currencies and social upheaval that I find it ridiculous that the inflationists would today be taking shots at sound money and Credit. It is the inflationists Clinging to Misguided Monetary Mentalities. The principle of sound money and Credit has no reason to have to defend itself. Inflationism doctrine is riddled with failings: Easy Credit distorts system pricing mechanisms; foments destabilizing speculation; spurs societal wealth transfer; distorts the underlying economic structure; fosters financial fragility; and debases the currency – to name just a few. History – including recent history – validates this analysis. Yet there are two particular facets of today’s inflationism that make “Keynesian” policymaking extraordinarily dangerous. First, the global backdrop is one of unchecked Credit and the absence of any disciplining global monetary regime. Policy mistakes are free to run longer and with enormous global financial and economic consequences. Second, policymakers and pundits herald incredible post-Bubble policy responses, while failing to recognize that aggressive stimulus is, once again, fostering problematic Bubbles. For too long the inflationists have been negligent in their disregard for Bubble dynamics. The inflationists are keen to argue that, with “inflation” remaining so low, policymakers enjoy unusual latitude to stimulate. By this point, haven’t we learned that rising CPI is not a primary contemporary risk associated with ultra-loose monetary policy? The mispricing of risk, unchecked speculation, asset-Bubbles, financial fragility, and economic maladjustment have already proven themselves as deleterious effects of loose money. What is the Wall Street business model again? After Goldman Sachs’ most recent astonishing quarterly report that included some ungodly amount of profits from trading, isn’t it time for society as a whole to ask the simple question, what value are the Wall Street banks really providing to the world? I know a lot of people who work for these banks and by in large they are some of the brightest, most genuine people you could ever meet. They work very long hours, don’t do anything illegal or unethical, and certainly don’t deserve populist ire. Accordingly, my concern about the relative costs and benefits of the current Wall Street model is not an indictment of them. In other words, this is not a criticism of these firms from a bottom’s up perspective but more so from a top down, strategic point of view. I guess I just think proprietary trading, high frequency trading and anything having to do with the creation of new derivatives are highly risky, inherently opaque and have no place within company that is implicitly (as in too big to fail) or explicitly (as in the case of insured deposits) backstopped by the taxpayer. Call me old fashioned like Paul Volcker, but I agree with Martin Hutchinson (see his piece from which the below excerpt is taken from here) that most families still put food on the table even before we had $1B block trades and $500 trillion dollars in notional derivatives. I’m not saying we need to go back to the Stone Age, but at what point has the financial system gotten too large and too focused on rent seeking to be actually beneficial to society? Investment banking has changed radically over the last 30 years, and it's not clear that either regulators or the market fully understand the modern sources of its income. Trading, a fairly peripheral activity 30 years ago, has come to dominate the investment banking income statement, with income arising for investment banks both through acting as intermediary and through "proprietary trading" for their own account. The immense and unstoppable proliferation of derivatives is the principal factor that has brought this about. After all, total outstanding derivatives contracts at the end of 2008 had a nominal principal amount of $514 trillion, more than 10 times Gross World Product. You don't need to skim very much off the top of a pot of cream that size to make your practitioners very rich indeed. A decade ago, defenders of the derivatives revolution could reasonably claim that the economic value and risk of those contracts was a tiny fraction of the total outstanding. Today, when we have seen multiple examples of credit default swaps paying close to 100% on billions of dollars of obligations, that claim has become laughable; the fraction of risk involved in that $514 trillion isn't as tiny as all that. The intellectually curious must wonder what purpose all this activity serves. Defenders of derivatives and trading in general mutter the magic words "hedging" and "liquidity" and expect their questioners to fall back abashed. However, there aren't $514 trillion of exposures to hedge; indeed in a $50 trillion world economy, there aren't even $50 trillion of exposures to hedge. Hence – and this is a very conservative estimate – 90% of all derivatives activity serves nobody beyond the dealer community. If the economic value of hedging and liquidity are modest compared to the galactic amounts of contracts outstanding, or even to the enormous sums earned by trading, then it follows that some pretty large percentage of trading revenues represents nothing more nor less than rent seeking, the extraction of value from the economy without providing any economically valuable service in return. The explosion in derivatives and trading volume can then be seen as a gigantic smokescreen, which has enabled Wall Street to extract larger and larger rents from the remainder of the economy. For S&P 500 companies taken together, about 28 percent of sales come from outside the US. That's up from about 24 percent three years ago (the 50 percent figure often quoted in the press is from S&P's smaller sample of companies that specifically represents large global companies, and therefore likely skews the number higher). It's important to keep in mind that the bulk of these international sales originate from developed markets. Only about 5 percent of total revenues come from developing markets, including most of Asia, Brazil, India, and from those areas that are reported broadly as ‘Emerging' or ‘Developing'. This number likely doesn't capture the entire sensitivity to areas that are likely to grow faster than the US. There are sales that are not included in this number because of insufficient disclosure. Also, there are second-order effects – US companies may sell products to companies in other developed economies, which are used in the production of final goods that are sold to developing markets. A generous estimate might double the portion of sales that are sensitive to fast-growing countries, to 10 percent. This may be an overestimate, but it picks up the trend of S&P 500 earnings becoming more global and sensitive to developing economies. Next year the S&P 500 revenue per share is expected to be $975 a share, with earnings of $75 a share. We'll apply an above-average profit margin of 8 percent the developing-market sales, because the technology group is somewhat over represented among these companies. This gives us $7.80 a share in earnings that are sensitive to developing economies ($975 * 10% * 8%) and would be subject to the benefits of potentially higher growth in those regions. Now, $7.80 out of a total $75 of earnings is not immaterial, and it's a percentage that is likely to grow when the global economy eventually heals. But it turns out that the estimate of profit margins may end up playing a much more material role in whether S&P earnings meet or surpass expectations. Analysts are forecasting 7.6 percent profit margins next year, compared with a long-term average of less than 6 percent. If profit margins turn out to be a point lower, just 6.6 percent instead of 7.6 percent, then estimated earnings are almost $11 a share too high – $3 more than our estimate of the entire contribution of developing markets earnings. If profit margins come in at the long-term average, then forecasted operating earnings will be $16 a share too high, at least twice the entire contribution of developing markets to earnings. If we observe a tepid recovery of developed markets over the next couple of years, trends in profit margins will likely have the greatest influence in whether earnings reality meets expectations. In case you had forgotten; recovery is still all about jobs: Hat tip to Yaser Anwar for bringing this piece by none other than John Hatzius of Goldman Sachs to my attention. You know the BLS data has to be pretty shaky if even a Goldman guy is pointing out the numerous flaws in the calculation of the number of jobless in the US. If you read The Market Ticker or Zero Hedge you are probably well aware of the optimism inherent in the monthly jobs reports. The main skewing factor is the birth/death model of small businesses that inexplicably and consistently estimates that thousands of new jobs are being created when entrepreneurs start up new businesses. Really, with what credit I ask? The behavior of the household survey of employment also suggests that the preliminary payroll data may still be too optimistic. Unlike the establishment survey, the household survey is not subject to small business bias because employment is measured at the level of the individual worker rather than the level of the establishment. It is therefore noteworthy that the household survey—adjusted to conform to the definitions of the establishment survey—shows an average loss of 479,000 jobs per month since the March 2009 benchmark date, about 140,000 more than the nonfarm payroll data. This is consistent with the idea that the birth/death model continues to result in overly optimistic nonfarm payroll data. So what are the implications of the small firm story? First, it suggests that economic activity probably remains weaker than suggested by some standard economic indicators. Although both the economy and the financial markets are in much better shape than they were earlier this year, we are far away from a V-shaped recovery. Second, however, the financial market implications of our story are more benign than one might think at first glance. Even if the small business sector remains mired in weakness, the equity market—which almost by definition is dominated by larger firms—could continue to do significantly better than the overall economy. This is not to deny the risk of adverse “spillovers” from small firms to larger firms, e.g. via continued weakness in household income and thus lackluster consumer demand. But at least in the short run, underlying weakness in the overall economy and decent profit news for publicly traded firms need not be as contradictory as they sound. What would happen to the price of oil if the economy really started to recover? Hat tip to The Pragmatic Capitalist for posting the link to this piece in Business Week. The article points out the irony in the fact that the US has printed all this money and provided all these stimuli, but one unintended consequence has been the dramatic rise in the price of oil. I think this goes to show there is no free lunch. You can load up the helicopter with $100 bills and toss them out like Santa Claus but even in a liquidity trap there are unintended consequences in the asset markets. We know that people are very sensitive to how much they are shelling out at the pump. I would really hate to see what $4 gas would do to consumer spending and sentiment given the dire unemployment situation. It’s scary to think how much oil has risen (even if speculation is playing a role) given the lack of anything I would call a sustainable recovery. The question is, if the economy really does start to recover, what’s to stop oil from going back over $100? Combine that with the Fed raising interest rates and you could almost bank on a double dip recession. The point is to keep your eyes on the non-equity asset markets to make sure that (a) you aren’t investing a liquidity induced bubble (b) asset inflation is not becoming a substitute for CPI inflation and (c) prices have not completely decoupled from economic reality. Another excuse given is that oil is following the equity market, but that's not how it's supposed to work. The futures market for oil is supposed to be governed by supply and demand, not react sympathetically to speculative moves in equities. In any case, it's been reported widely this year, starting with Der Spiegel 's article on July 28, that the excess liquidity put into the system by central banks worldwide, money that was supposed to be put into consumer and business loans, has once again been used for speculation and quick paper profits in stocks and commodities, including oil. As Washington irony goes, this is a new high-water mark: They've printed money to save our financial institutions, claiming it's there to stimulate a recovery. Yet much of that newly minted money is being used against consumers and small business owners. The money that's supposed to save them in new loans is instead increasing their energy costs through speculation, to the point of devaluing corporate earnings and personal incomes and prohibiting other purchases. The sad truth is that if oil costs have more than doubled during a period when so little economic growth was taking place, you have to wonder how high the oil market will rise next year, when a real recovery has the chance of taking hold. In that statement lies the fact that this recovery will be stopped again. As of February 2012, all future posts from The Inoculated Investor will appear at http://covestreetcapital.com/Blog/?cat=14. Please visit the site to subscribe to Cove Street Capital's blog. Feel free to email me at inoculatedinvestor@gmail.com if you have any comments or questions.